A large body of Turkish cavalry about to cross the Alma river. 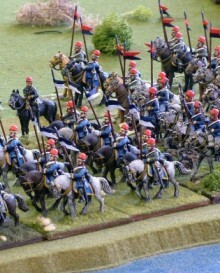 As I recall, this particular unit crossed and then was helped to cross back over by my Horse Artillery! Barry's guide to getting that `lived in' look for you miniature armies. Various painting techniques and ideas explained in an easy to access way. A comprehensive guide to my flag making methods including illustrative pictures of the finished products which show the techniques described in the guide. A painting guide to German `field grey' uniforms 1939-45 with painting mix charts and full guide to variations achievable with different colour combinations. A guide to maximising the gaming potential of your Grand Alliance Period units including ideas on how to make them fit into up to six different armies with minimal extra work.